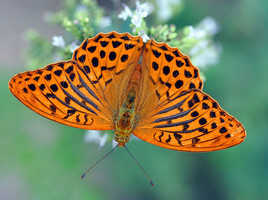 The subfamily Heliconiinae is composed of a diverse group of species distributed widely in the New and Old World tropics, and it also includes the largely Holarctic fritillaries (Argynnini). Many species in Heliconiini and Acraeini sequester and/or synthesize cyanogenic glucosides, which render them unpalatable to predators. 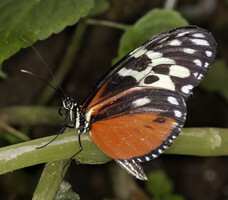 As a result, they act as Müllerian mimics or models for palatable Batesian species in other groups. Freitas, A. V. L., and K. S. J. Brown. 2004. 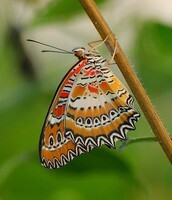 Phylogeny of the Nymphalidae (Lepidoptera: Papilionoidea). Systematic Biology 53:363-383. Penz, C., and D. Peggie. 2003. Phylogenetic relationships among Heliconiinae genera based on morphology (Lepidoptera: Nymphalidae). Systematic Entomology 28:451-479. Silva-Brandão, K. L., Wahlberg, N., Francini, R. B., Azeredo-Espin, A. M. L., Brown, K. S. J., Paluch, M., Lees, D. C. & Freitas, A. V. L. 2008. 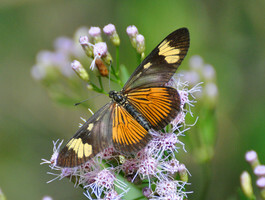 Phylogenetic relationships of butterflies of the tribe Acraeini (Lepidoptera, Nymphalidae, Heliconiinae) and the evolution of host plant use. Molecular Phylogenetics and Evolution 46, 515-531. Actinote discrepans photographed in Rio Grande do Sul, Brazil, in April 2010. Page: Tree of Life Heliconiinae Swainson 1822. Authored by Niklas Wahlberg and Andrew V. Z. Brower. The TEXT of this page is licensed under the Creative Commons Attribution License - Version 3.0. Note that images and other media featured on this page are each governed by their own license, and they may or may not be available for reuse. Click on an image or a media link to access the media data window, which provides the relevant licensing information. For the general terms and conditions of ToL material reuse and redistribution, please see the Tree of Life Copyright Policies.